Red Heart® Super Saver®, 100% Acrylic, Art. E300 (8 ounce solid/6 ounce multicolor skeins). Crocheted or Knit version: 8 Ounces each No. 313 Aran CA, No. 382 Country Blue CB, and No. 380 Windsor Blue CC. Lapghan measures approximately 39" square. GAUGE: Rnds 1-6 = 7 ¾" across. CHECK YOUR GAUGE. Use any size hook to obtain the gauge. Rnd 1 (Right Side): Ch 3, 2 dc in ring, ch 3, [3 dc in ring, ch 3] 3 times; join with a sl st in top of ch-3. Rnd 2: Sl st in next 2 dc and into ch-3 sp, ch 3, (2 dc, ch 3, 3 dc) all in same ch-3 sp, ch 1, * (3 dc, ch 3, 3 dc) all in next ch-3 sp, ch 1; rep from * around; join to top of ch-3. Fasten off. Rnd 3: With right side facing, attach CC in any corner ch-3 sp; ch 3, (2 dc, ch 3, 3 dc) all in same ch-3 sp, ch 1, * 3 dc in next ch-l sp, ch 1, (3 dc, ch 3, 3 dc) all in next corner sp, ch 1; rep from * around; join. Rnd 4: Sl st in next 2 dc and into ch-3 sp, ch 3, (2 dc, ch 3, 3 dc) all in same ch-3 sp, ch 1, * 3 dc in next ch-l sp, ch 1; rep from * to next ch-3 corner sp **; (3 dc, ch 3,3 dc) all in next corner sp, ch 1; rep from * around, end at **; join. Rep Rnd 4 for pat and work 2 more rnds with CC. Fasten off. ***Next Rnd: With right side facing, attach CA in any corner ch-3 sp; ch 3, (2 dc, ch 3, 3 dc) all in same ch-3 sp, ch 1, * 3 dc in next ch-l sp, ch 1; rep from * to next ch-3 corner sp **; (3 dc, ch 3, 3 dc) all in next corner sp, ch 1; rep from * around, end at **; join. Work 5 more rnds CA, then 4 rnds CB, 4 rnds Cc. Rep from *** once more - 36 rnds. Fasten off. Weave in ends. 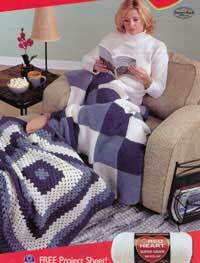 Lapghan measures approximately 37 ½" square. Knitting Needles: 5 mm [US 8]. GAUGE: 17 sts = 4"; 24 rows = 4" in pat. CHECK YOUR GAUGE. Use any size needles to obtain the gauge. Row 2: P1, * K1 , P1; rep from * across. Rep Rows 1 and 2 until 46 rows in all are completed, end Row 2. Attach CB, cut CA. Continue in pat and work 46 rows CB, 46 rows CC, 46 rows CA, and 46 rows CB. Bind off. STRIPS 2 and 5: Work same as Strip 1 in the following color sequence: CB, CC, CA, CB, CC. STRIP 3: Work same as Strip 1 in the following color sequence: CC, CA, CB, CC, CA. FINISHING: Arrange strips 1-5 as pictured with all cast-on edges at lower edge and sew together. Weave in ends. ABBREVIATIONS: CA, CB, CC = Color A, Color B, Color C; beg = beginning; ch = chain; dc = double crochet; K = knit; mm = millimeters; P = purl; pat = pattern; rep = repeat; sl st = slip stitch; sp = space; sf = stitch; * or ** = repeat whatever follows the * or ** as indicated; [ ] = work directions given in brackets the number of times specified.